No orthodontic patient, or former orthodontic patient, wants their straight teeth to be ruined by the eruption of wisdom teeth. But it’s easy to forget about wisdom teeth if they’re not causing any problems. Your orthodontist, however, always has these third molars in mind, especially when it comes to youth braces. There are plenty of reasons wisdom teeth are relevant to orthodontic treatment, even if they haven’t made their way above the gum line yet. Wisdom teeth can get in the way. Impacted or partially erupted wisdom teeth are usually positioned behind or under the second molars. With the wisdom teeth are causing an obstruction, the second molars cannot be moved effectively. Late eruption of wisdom teeth can ruin everything. The last thing you want is for your investment in orthodontics to go to waste because wisdom teeth have erupted and knocked your straight teeth out of alignment. Wisdom teeth can crowd teeth. One of the many reasons people pursue braces is to eliminate overcrowding. Even if you didn’t have little room to spare before, dental crowding is a possibility when you have more teeth above the gum line than your mouth can handle. 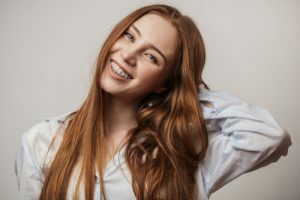 By the late teen years, the jaw is almost completely grown, which means there may not be any room left in your mouth for new teeth to take up a spot. Wisdom teeth can cause other oral health problems. Teeth that are out of alignment – particularly malpositioned wisdom teeth – can damage adjacent teeth, causing tooth decay and bone loss. Even wisdom teeth that aren’t impacted can be difficult to keep clean because they’re simply too hard to reach. And, straight teeth or not, this problem can cause tooth decay, putting the rest of your teeth at risk for poor oral health. Wisdom teeth can cause serious pain. If a wisdom tooth is impacted, this may go unnoticed for a little while – until suddenly the pain arrives and you know you have a problem. The pain can be caused by an infection or simply from the pressure these additional teeth place on the mouth. What’s the Right Wisdom Tooth Decision for Youth Braces? If a patient has plenty of space in their mouth, your orthodontist may be comfortable waiting to see what happens with your wisdom teeth. This is often the case anyway because so many patients have their braces applied long before the wisdom teeth might erupt. Taking x-rays after braces have been removed will be an important part of follow-up treatment to check the growth progress of the wisdom teeth. One of the biggest rules about post-braces care is to wear your retainer diligently. Following this rule can help prevent wisdom teeth from doing damage to straight teeth or making them shift out of alignment. The biggest question is: Should my orthodontist remove my wisdom teeth before braces, after braces, or at all? And the answer is: Every patient is different. Some people don’t even have wisdom teeth! And even if you’re wearing Invisalign, the presence of wisdom teeth matters. What’s important is protecting your investment in your child’s youth braces or your own, and that means keeping tabs on your wisdom teeth. Ask your Center City orthodontist what is most important to know about wisdom teeth and how your own teeth could affect your braces. Schedule a consultation at Roberts & de Marsche, the orthodontic practice serving Center City, Philadelphia and Lawrenceville, NJ.